It's been a nice day to stay warm inside and let the world go by without you for a while. Lining up in the driveway. about this being the best ride ever. Oh! Off into the weeds. Checking out the local flora. This ride degenerated into circles and I coudn't wait it out. 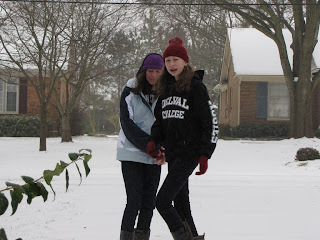 You might notice the camera shaking because I was shivering. 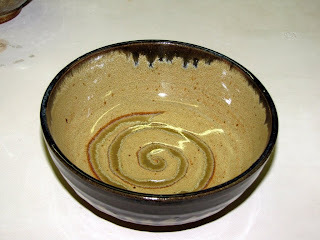 The bowls I made for the Empty Bowls event came out of the glaze kiln and I like some of the combos I used. Look for some of these on future pots. You can check out the whole batch here. 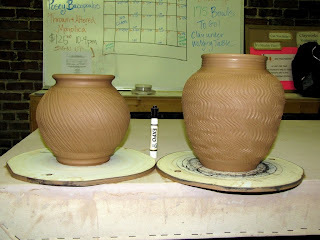 After documenting the glazes, I got to work on some new pots. I made another heavily textured pot using phoenix (the last one was orangestone) and tried some shapes for a soup bowl with a mug handle that someone asked me for. I also made another casserole with a (hopefully) less-domed lid than the last one. 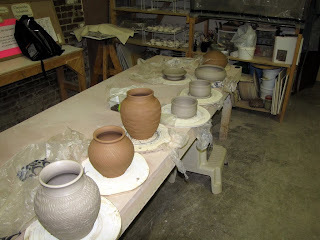 I left the other pots out to dry a bit so it looks like I have a table full of work, but some of it was from the weekend. My shelf is bowing under the weight of all my pots and reclaimed clay buckets and since I am on the top shelf, people below me are understandably nervous. While I sometimes daydream about a day I can afford to become a member and have a whole set of shelves to fill, having one shelf really makes me think creatively about how to fit everything on it. I always have things hanging off the shelf or teetering on top of containers that make people nervous. I like living on the edge (of the shelf). I have to figure out which rim dip it was. I like the spotting on the rim. and it dripped pretty uniformly. Soup bowl awaiting mug handle. I need to work on this shape more. Another casserole with the lid behind it to the left. 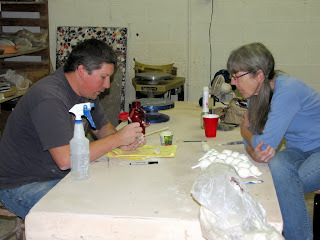 I went to Clayworks on Saturday to do a raku firing and make pots (go figure!). 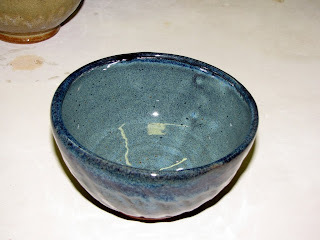 I didn't get any pictures of the raku (hopefully someone else did). 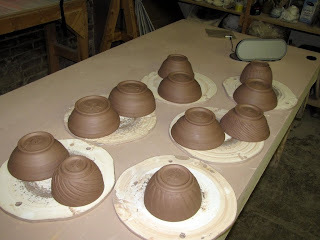 I fired two pots and Becky did some horsehair birds, among others. 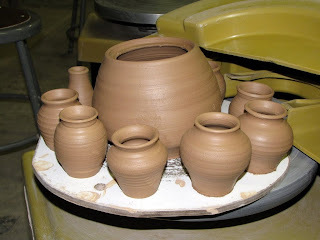 It was a good firing and it went pretty smoothly. 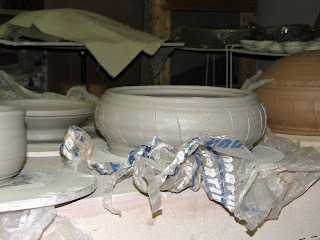 I threw some pots but forgot to take pictures of them again and put them away. Doh! 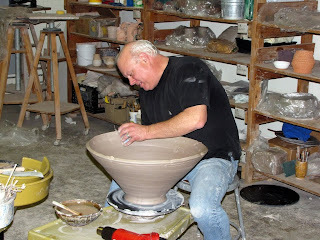 Luckily I DID remember to take pictures of Chuck making one of his biggest pots yet. 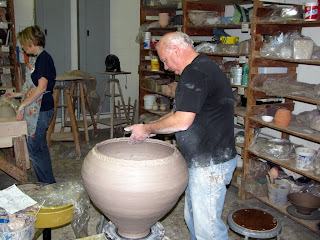 He is taking Tomoo Kitamura's sculpture class and has thrown the bottom portion of this pot and is now adding coils and smoothing them as he goes. I not only applaud Chuck's expertise, but his patience. I don't have the diligence to stay on one piece that long. This pot is going to be amazing. I'll keep you posted. Chuck adding the first coils to his thrown piece. Further along the process (much later in the day). 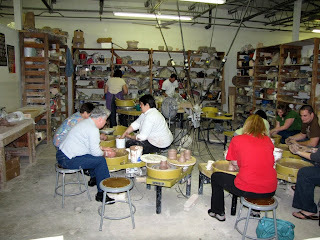 Thursday I went to Clayworks to glaze my Empty Bowls and make some more pots. 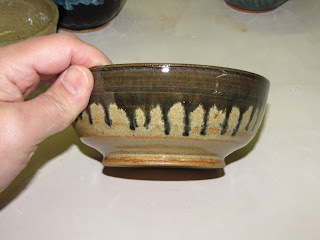 The Empty Bowls project is a great way to try out new forms and glaze combos. I haven't gone crazy with the shapes, but I can really tweak some of the lines and textures that I haven't tried yet. The glazing is another area I can play with and I tried some new combos on some of the newer glazes with some tried and true ones. 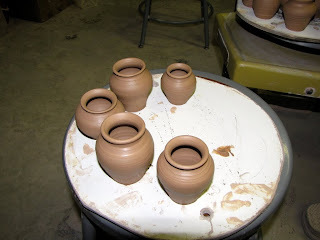 I'll post pictures of the finished pots to show what happened to them. The best part is they go to a very good cause and I am honored to be a part of it. Later I threw some pots and tried out a new texture idea. The first one is textured using the 'seashell' technique of scraping it with the seashell. 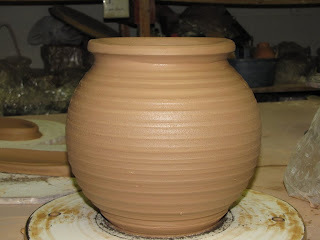 On the second pot I used the plastic serrated tool and 'squiggled' it in columns around the whole pot. 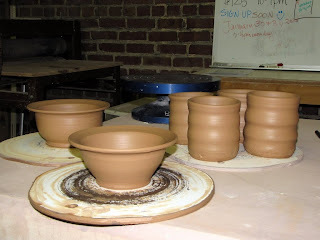 Each of these pots start out as straight cylinders. I then score the outside of it, then only push it out from the inside without touching the exterior. Next I put a lip and a foot on them. 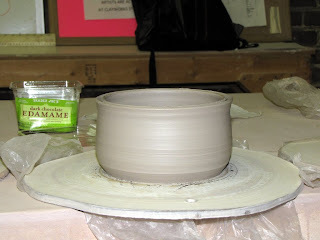 On the first one I actually rolled the lip down and reattached it to the pot. The second on was pulled up and then scored with a wooden tool. I really enjoy working with these textures and look forward to exploring more of them. 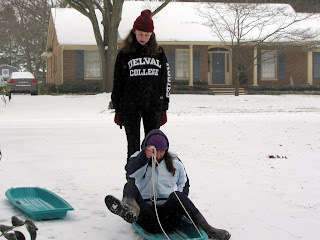 A big thanks to Adrienne Dellinger for teaching this technique to me all those years ago. 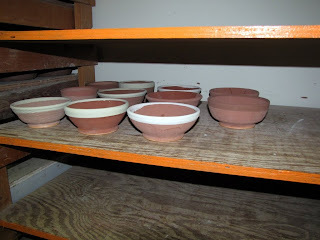 Glazed Empty Bowls waiting to be loaded. 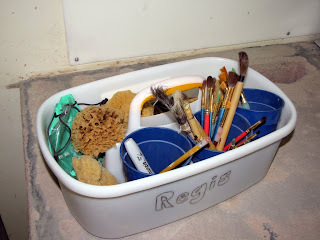 My glaze tool caddy has everything, including marbles. 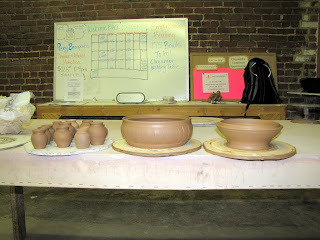 Wednesday I worked on an orangestone casserole and trimmed my small pots. I am trying to use all of Adrienne's techniques on my casserole form, but I'm afraid my lid might be too domed. 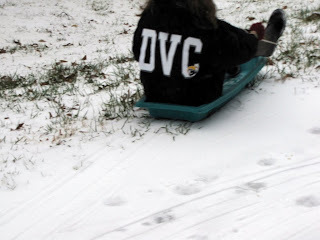 We'll see how it trims out. Small pots and grownup casserole with lid. Saturday was a Muddy Fun day and it was a blast as usual. Angela and I were there to assist Maggie with another group of Muddy Funners. All went well and some folks said they were going to sign up for regular classes. Good deal. Angela and Maggie assisting Muddy Funners. by making them into whistles. Very cool. I didn't include the fact that they're just fun to make, but that goes without saying. 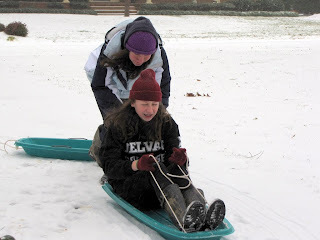 I like to have fun whenever possible. Teapot body, spout and tiny pots. Lots of "slap trays" today. 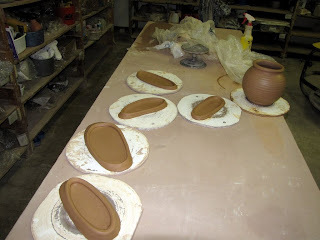 I hope to make butter dishes out of the smaller ones and I'll put handles on the larger ones. A friend tells me the larger ones make a fine sushi tray (he rolls his own). I might make some creamer sets to go on some of the larger ones. 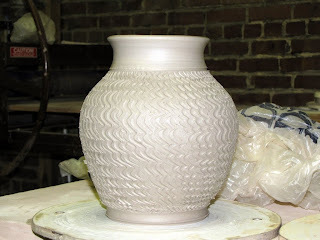 I also made a larger pot that is still pretty heavy for it's size. It might get recycled or become a yard pot, not sure yet. (almost forgot to get the camera out again). I think I made 10-12 of them. Possible yard pot or could become something else. The time on my pictures tells the story: I was cleaning up at 1:37 am Friday after throwing Thursday night. I was trying out some larger (huge) mug shapes since my last set shrank to miniatures. 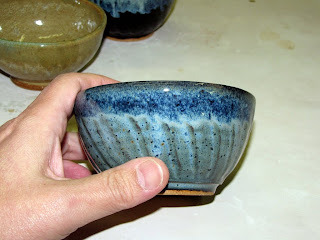 I also decided to try some rimmed bowls and trimmed my bowls for the Empty Bowls project. 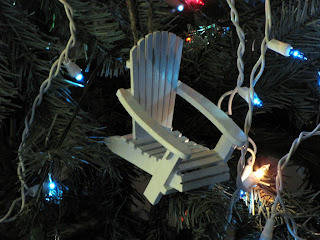 This project supports the Second Harvest Food Bank and Clayworks makes a large number of bowls for the event each year. If you are in the area on February 26th between 11:30 am and 1:30 pm please make plans to attend. 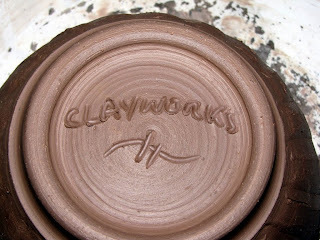 Look for the Clayworks mark. New Year's Day we were at my brother-in-law Scott's for our big holiday dinner. Scott is a great cook and always does most of the cooking at our get togethers. We appreciate it and make him proud by eating way more than we should. 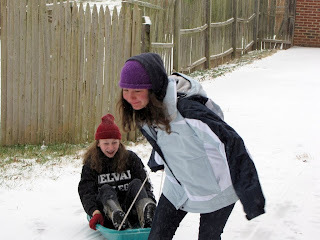 The cousins love to hang out together on these trips and have a great time. 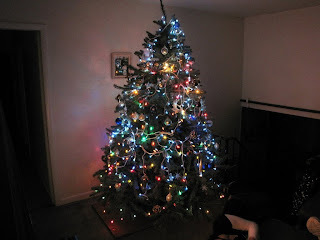 Justin and Ryan decorated the tree. Stephanie being crushed by Justin's feet. 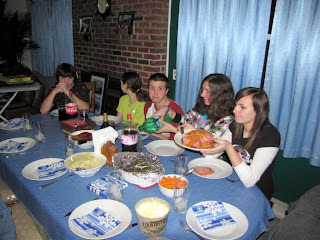 Ryan, Meredith, Justin, Stephanie, Audrey. Karen, Eva, Pop-pop, Ryan, Meredith, Justin. 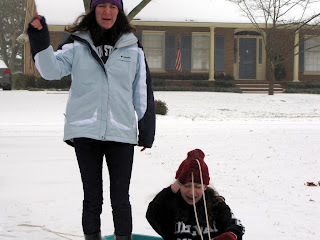 As you can see, everyone is having a terrible time. After a big meal, everyone chills watching TV. It's nice to be home during the holidays. 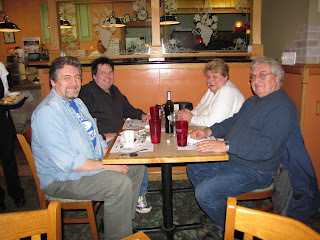 On New Year's Eve my brother Dave and I went with my parents to their favorite restaurant. Ecco Domani is a small place in a shopping center near their house, but don't let it fool you. Julio (the owner) is a wonderful chef and we've never been disappointed there. Thursday was no exception. We started out sharing a fried calamari appetizer and then I ordered the eggplant parm which isn't one of the more exotic dishes on the menu, but I don't get to have it very often so I jumped at the chance and it was fantastic. For dessert we all shared a great tiramisu that's made right in the restaurant. 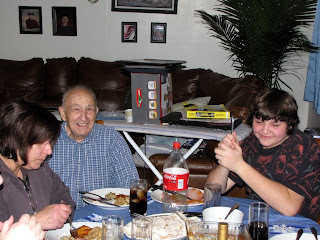 Later, Julio brought out some black sambuca to finish the meal. After dinner Dave and I went to his apartment for our annual night of video gaming. Good times. 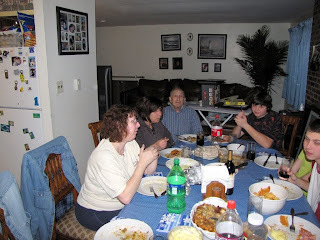 Me, Dave, Mom, and Dad. 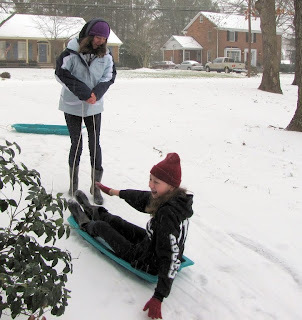 We were hanging out on Wednesday at my brother-in-law Scott's house. 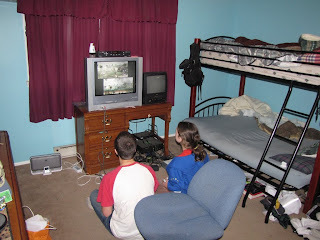 The kids always seem to congregate there to play video games, watch TV, and eat big meals. Justin and Meredith playing some educational games. 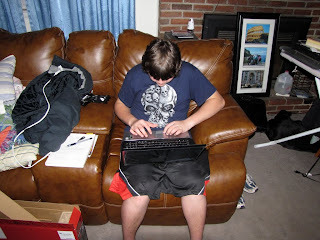 Ryan working on the new laptop. 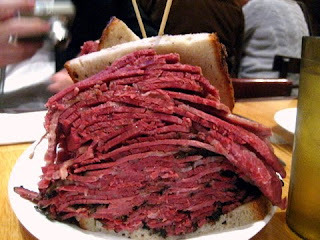 On Tuesday afternoon my parents took my brother Dave and I to the Carnegie Deli at the Sands in Bethlehem. They told me that the sandwiches were outrageously large, but I still wasn't prepared for the size of them or how great they tasted. I ordered a hot pastrami on rye with mustard and cole slaw. The pastrami was easily the best I've ever tasted since it just melted in my mouth. I didn't get a decent picture since cameras are not allowed in the casino and my cell phone pictures were horrible so I found a picture of the pastrami sandwich on the web. We (over) ate at the deli and then played some slot machines. I quit after spending five and winning fifteen and just enjoyed watching everyone else for a while. 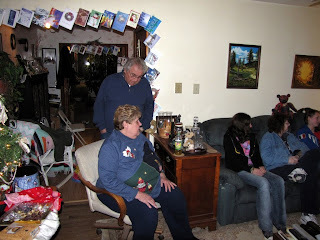 Later that evening we were at my parents' house having our Christmas with them. We exchanged our gifts and had some snacks. 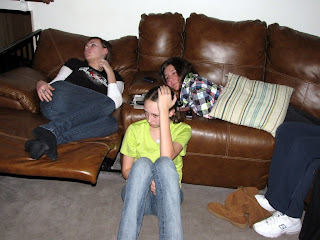 Later we had the giggles while we played some Wii games that Dave brought with him. 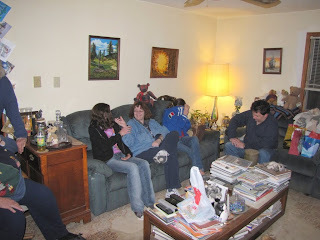 Stephanie, Karen, Meredith (hiding), my brother Dave.